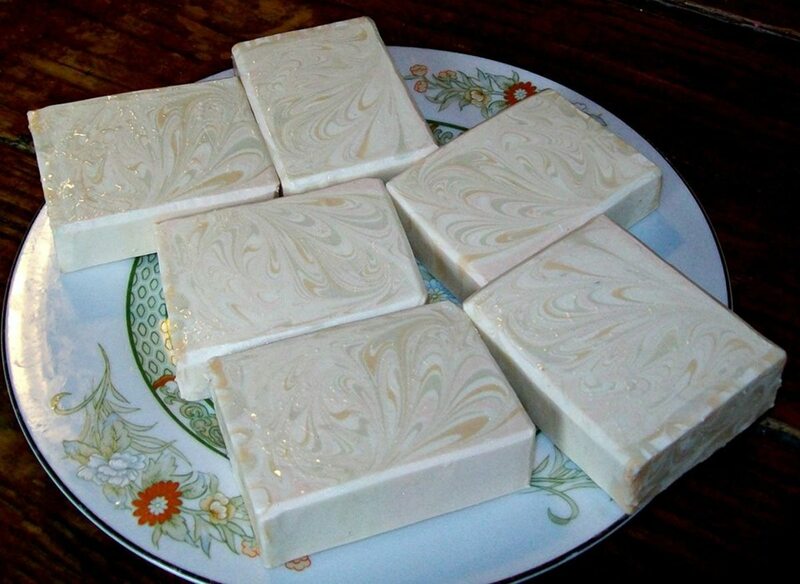 Looking for a Really Great Soap Recipe? Here are a few soap recipes--some good, some not so good--presented along with my thinking about what makes a soap good. These recipes are also presented to illustrate how to develop a good soap formula. These are just my opinions, though. Soapmaking is an art, so no ones opinion really counts for all that much--maybe least of all mine, since I have only been making soap for less than two years. But I am a recipe nerd! Fine-tuning soap qualities became my soaping "mission" early on. 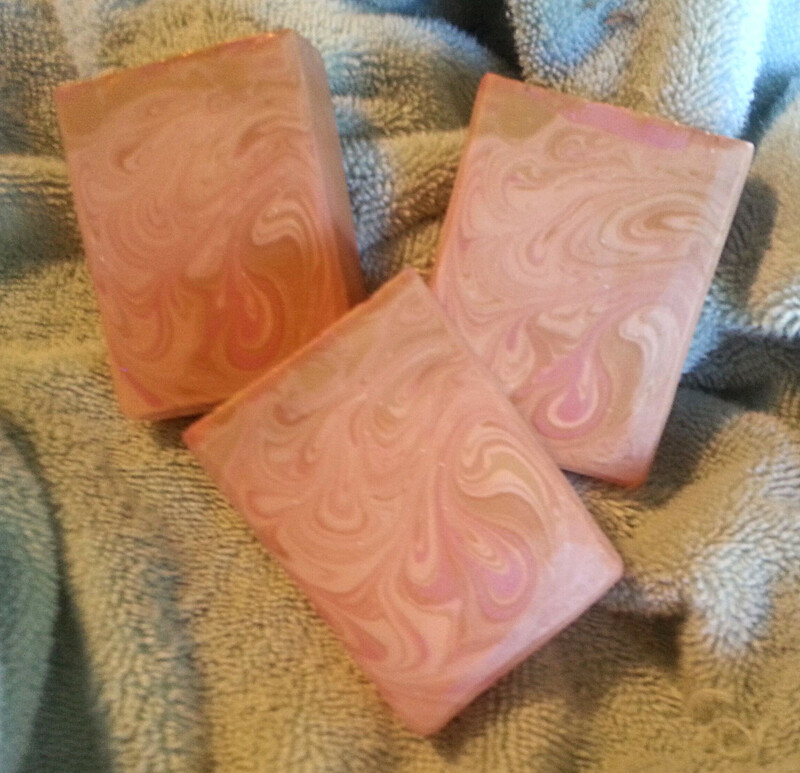 I've given recipes for four soaps, beginning with the lackluster Soap #1. Most of the pictures are of the Soap #3 Recipe, because this is the recipe that I've been happy to use for nearly a year. Soap #3 (again, in my opinion) is an excellent recipe, but I think the Soap #4 Recipe is better. Here's the story of the evolution of a recipe. Like most beginning soapmakers, my soapy adventures began with recipes I found online. I think this is a perfectly reasonable starting point. 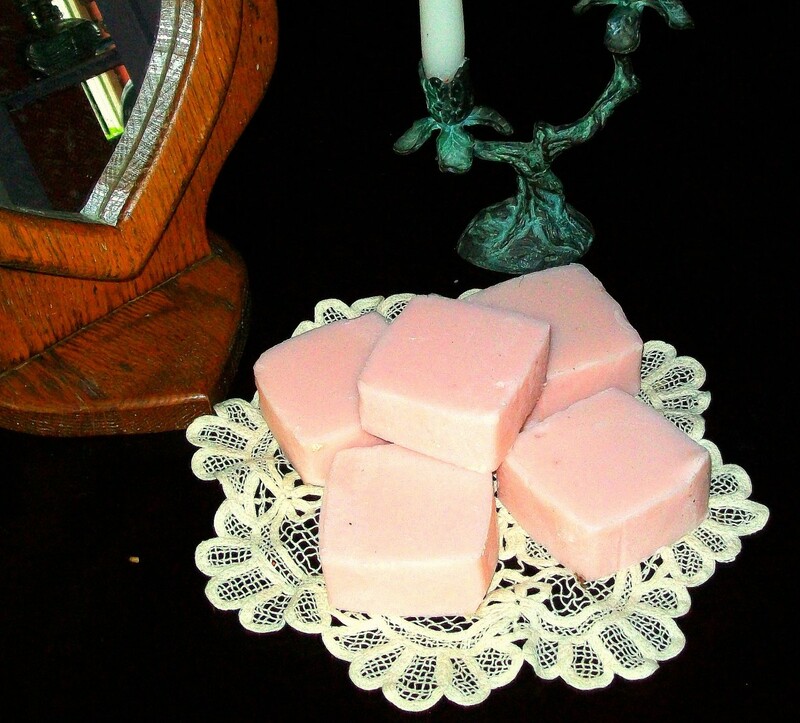 Some experienced soapmakers become highly offended when beginners ask for a soap recipe. This is because, after months or years of experimentation, which cost them many hours toiling over crock pots and sweating bullets to understand lye calculators--not to mention quite a few bucks--they achieved the perfect bar of soap. They began with a fairly simple recipe and produced many variations of it, each of which was critically evaluated--often by a small army of friends and relatives acting as testers. If The Recipe was tested and found wanting in some desirable quality, the soapmaker began another round of experimentation. So beginners who go online requesting recipes are often told to figure it out on their own--when they are not actually suspected of industrial espionage. Anyone can make soap. You can make soap with lard, as our foremothers did. You can make soap with coconut oil, olive oil, palm oil, or any of the other oils on the grocery shelves. Some of these oils will make a perfectly servicable soap all by themselves. (Some will not.) And a soap made only with lard, coconut, olive, or palm oil--while it may have some defects--will beat the pants off of the detergent bars (called "beauty bars") that you will find over in another aisle at the grocery store. They'll beat the pants off of them because they are soap, rather than a mixture of detergents and chemicals, which also usually contain a cheap synthetic fragrance to mask the subtle unpleasant scent of these concoctions. Even a simple soap is much kinder to the skin than most commercial "detergent bars." But beginning soapers who have a little experience under their belts, and have learned that they can definitely make soap, often want to take it to the next level. They'd like to make really great soap. What Makes a Great Soap Great? What exactly is a really great soap? A really great soap would be a soap that makes a decently hard bar that produces a long-lasting lather that is a balance of bubbly and creamy. It should feel wonderful on the skin, not strip the skin's natural oils, and contain enough superfat to replenish any skin oils that are washed away. Further, the oils in the superfat (and the soap itself) should be the most desirable kind in terms of skin benefits. While you can only accomplish this last with certainty by making hot-process soap--which allows you to choose your superfat--you can do this in cold-process soap to an extent, simply because the most desirable fatty acids in soaping oils are the slowest to saponify. So, for cold process, you just have to make sure that those "most desirable" fatty acids are included in your recipe in a reasonable amount. While I suppose it is obvious that a great bar of soap should do a good job of cleansing, it is hard for me to imagine any soap formula that would strike out in that department. Usually, a soapmaker's main concern is to formulate a soap that isn't overly cleansing. There are probably an infinite number of possible formulations for a truly great soap. It is an article of faith among soapers that every soaper's unique experimental journey leads them ultimately to a unique formulation of the "truly great soap." One reason this is an article of faith is because not just everyone will tell you their soap formula. Hint: The ingredients are usually on the label, and anyone with a fair understanding of soap qualities can run these ingredients through SoapCalc, or some other online lye calculator, and figure out how these ingredients can be optimally balanced. This experiment may reveal that someone else's "secret recipe" is actually not all that great. Many of the "real" soaps on the shelves at health food stores are, from the standpoint of artisan soapmakers, rather ho-hum--because making a decent soap for selling wholesale at a reasonable price has its own special set of constraints. It takes a certain amount of experience at soapmaking to recognize a good bar when you see one--or try one. This is partly because the simplest real bar of soap beats the pants off of commercial detergent bars and is so delightful to use that it can be hard to believe you haven't achieved the Ultimate Recipe right out of the gate. I mean, how could it get any better? I made the same basic coconut oil soap recipe over and over for about six months before I was ready to move on. As you try different recipes, and different variations of the same recipe, you steadily become more discerning. You can feel the difference between a 5% superfat and an 8% superfat, and the difference between a soap with linoleic acid and a soap without it. You've seen enough different kinds of lather to recognize good lather, and you've critically evaluated the appearance enough bars to recognize that silky, creamy look. The question is, how do you achieve all this? You may want to have a look at other online lye calculators. Here is the link to Brambleberry's lye calculator, if you'd like to have a look at it: http://www.brambleberry.com/Pages/Lye-Calculator.aspx. If you look at Brambleberry's lye calculator, you can see that it is very straightforward; just fill in the blanks. To choose a superfat level--at the very bottom of this page--beginners should usually choose 5%. 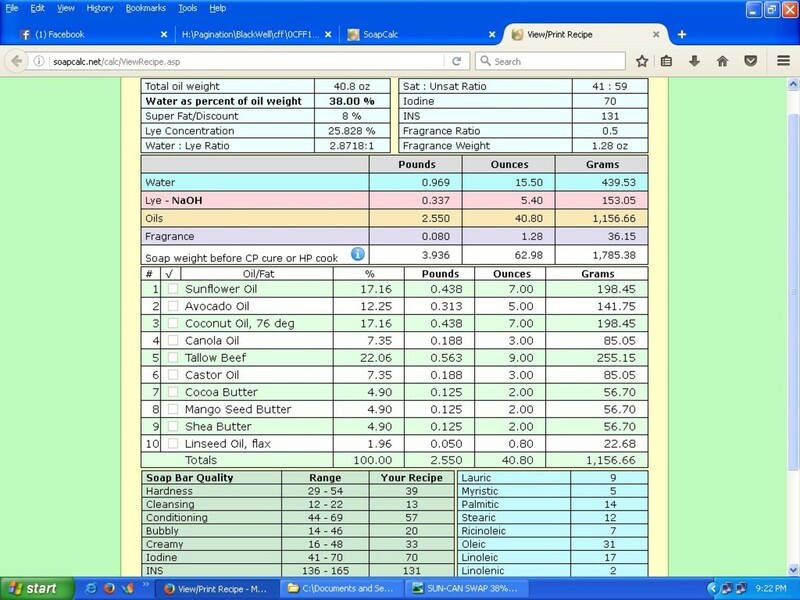 If you compare this page to the SoapCalc page, you will notice that on the SoapCalc page, 5% superfat is the default. There is a very good reason for this: While all the oils you could use to make soap have a SAP value--which allows the amount of lye necessary to saponify that particular oil to be calculated--in the real world, the SAP values of oils can vary due to weather and other growing conditions. 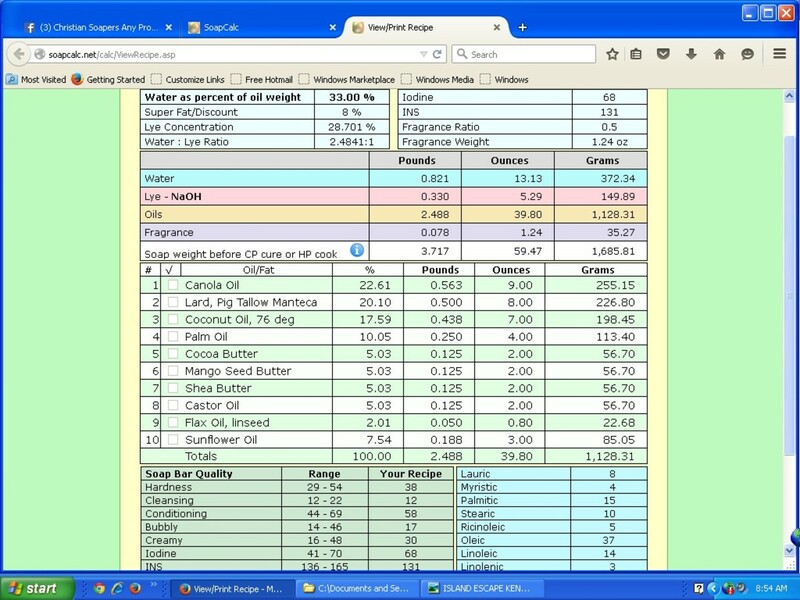 SAP values for all oils are, hence, averages. It is possible that the oils you are using do not have the average SAP value. There is no way to know, unless you have access to a lab. Your oils might require more--or less--lye than the average needed. If they require less lye than the average, and you calculated your recipe for 0% superfat, your finished soap could have excess lye in it. Excess lye makes soap harsh and can burn the skin. For this reason, it is the standard practice to calculate for at least 5% superfat--superfat being the amount of fats/oils that are left over after saponification. This minimum amount of superfat ensures that there won't be any excess lye in your finished soap. 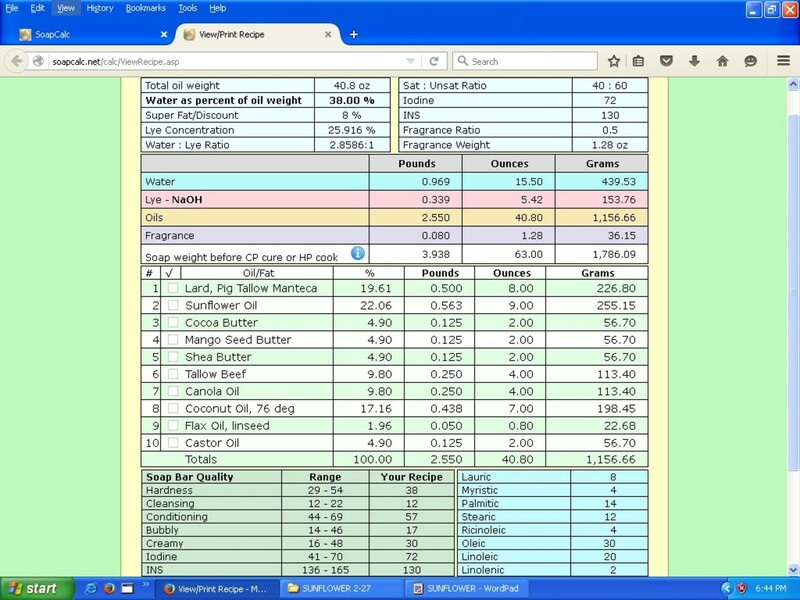 On Brambleberry's lye calculator, beginning soap makers will usually choose 5% superfat. Brambleberry's calculator only goes up to 10% superfat. While this is plenty for most recipes, sometimes you need a higher superfat than this. Now look at SoapCalc's lye calculator. Superfat is number 4 at the top of the page. SoapCalc will allow you to choose a higher superfat percentage than Brambleberry. If you click on the number 4, SoapCalc will supply an explanation for what is meant by superfatting. With the Brambleberry lye calculator, you simply fill in the blanks and click "Calculate." The calculator will then tell you how much lye and how much liquid (usually water) to use to make soap. This is fine, if that's all you want to know. The MMS lye calculator is useful if you want to know how much sodium lactate to add to a recipe, and it also allows you to calculate a recipe using dual lyes (both NaOH and KOH). Each of these lye calculators is useful in its own way, but if you want to use a lye calculator to gain an insight into soap qualities, SoapCalc is preferred. Luckily, there is no need to flail around in the dark about this. These questions have readily accessible answers. To find out these answers, your first stop should be to familiarize yourself with SoapCalc. SoapCalc is one of many online lye calculators. Here is the link: http://soapcalc.net/calc/SoapCalcWP.asp. SoapCalc can seen a little overwhelming at first, and some people prefer a simpler lye calculator, such as the one at the Brambleberry.com website, or the MMS lye calculator at Majestic Mountain Sage. Many people prefer them; I prefer SoapCalc. Looking at numbers 1, 2, and 3 in SoapCalc, notice that the default for 1 is NaOH, which is what you use to make bar soap. Click on the box with the 1 in it, and it will explain this. The number 2 allows you to choose your unit of measurement. If you are in the US, you will probably choose "ounces." If you are just about anywhere else, you will probably choose "grams." If you click on the number 3 in the box, SoapCalc will explain why their default for "Water as a Percent of Oils" is set at 38%. Beginners will normally want to leave this set at 38%. 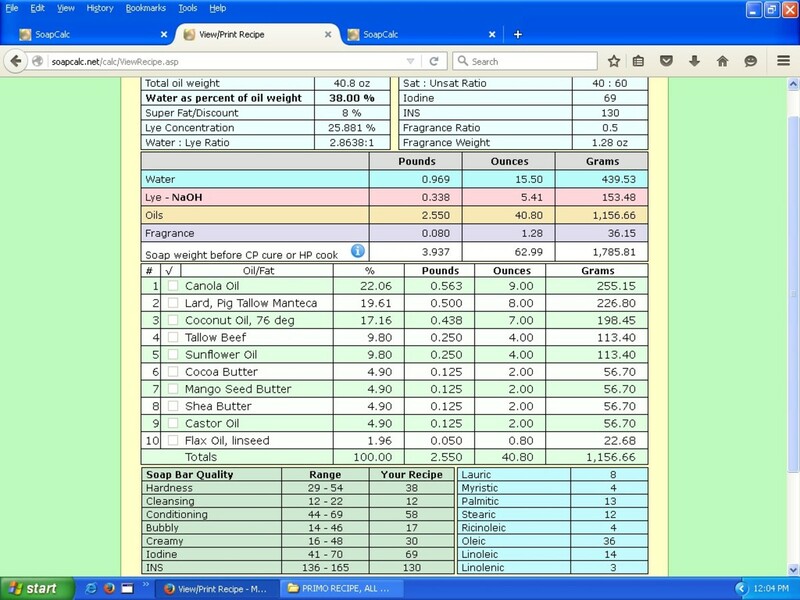 Notice that if you click on one of the oils in the "Oils, Fats and Waxes" list, SoapCalc gives you a column of numbers under "One." These numbers indicate the qualities you could expect in a soap made from this one oil alone. If you double-click on an oil, the calculator will put this oil into the "Recipe Oil List"--your recipe. If you double-click on more oils and add them to your "Recipe Oil List," the calculator will give you numbers that represent the soap qualities of this combination of oils in the "All" column. 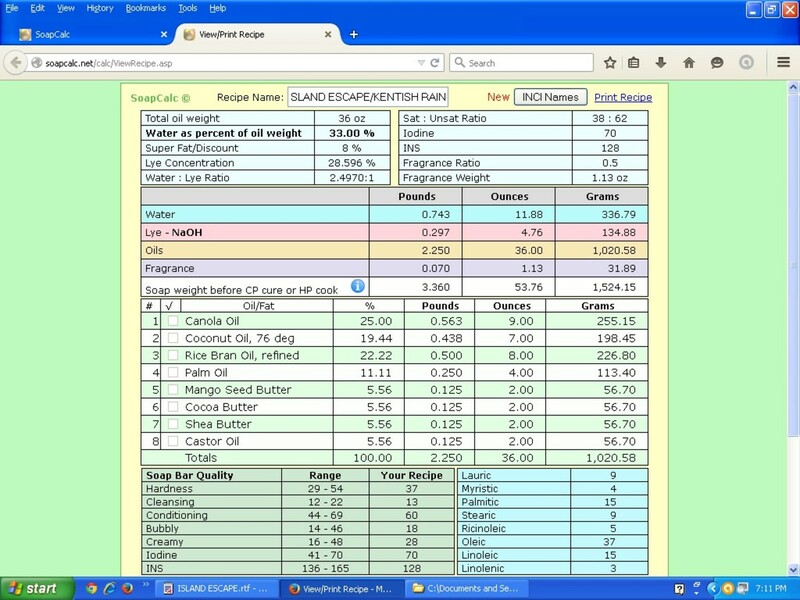 Now put a few oils into the "Recipe Oil List" and look at the numbers in the "All" column. If you hover over Hardness, Cleansing, Condition, Bubbly, Creamy, Iodine, and INS, the calculator will tell you the recommended range of numbers for each of these qualities, and you can check your numbers for each quality to see how your (for now "pretend") recipe measures up. While there is no substitute for experience--and lots of it--SoapCalc provides an evaluation of the qualities of just about any soap recipe you can dream up, and it provides a recommended numerical range that beginning soapmakers, especially, may want to heed. Or maybe not. You can learn a lot from "pushing the envelope." What Qualities Do Experienced Soapmakers Prefer in Soap? It is probably presumptuous of me to claim to know what "experienced soapmakers prefer." There are probably many who don't prefer what I prefer, and don't prefer what I think they prefer, so you may want to know where I'm getting these notions. They are drawn mostly from the comments and discussions among soapmakers in the many soapmaking groups, mostly on Facebook--though some are drawn from soapmaking forums. The best way to find out the views of experienced soapmakers is to join several of the soapmaking groups on Facebook, where thousands of soapmakers offer their opinions about everthing soap-related, answer questions, and help troubleshoot problems. Members also offer lots of inspiring pictures! I think we can assume that the "experienced soapmaker" prefers (and can make) a soap that has all the good qualities I mentioned earlier, but their preferences will be more fine-tuned. There seems to be a very strong tendency to shoot for very skin-conditioning, "moisturizing" recipes. In terms of SoapCalc numbers, this usually means a high Condition number, a low Cleansing number, and a moderately high superfat percentage. Perhaps unsurprisingly, experienced soapmakers do not always agree with SoapCalc's guidelines. Some soapmakers make 100% olive oil soap (Castile), or 80% olive oil soap (Bastile) with a merry disregard for the way these formulas are WAY outside all but one of SoapCalc's recommended numerical ranges. Olive oil is nearly unique among unsaturated oils when it comes to producing a very hard and very fine bar of soap when properly cured. SoapCalc does not reflect that. Unless you are making a Castile or Bastile soap, it is easy stay within SoapCalc's recommended Hardness range without compromising other soap qualities. At the lower end of this range--and even towards the middle of the range--you may want to add hardeners to your formula. Hardness can be increased by adding salt or sodium lactate. Sodium lactate is preferable for this purpose because salt has an adverse effect on lather, and sodium lactate helps lather, at least a little. High amounts of salt will also bleach out many soap colors, and sodium lactate will not. Sodium lactate is very beneficial to skin, as well, and works almost twice as well as glycerin as a humectant. Most soapmakers prefer a very low Cleansing number. Almost all soapmakers insist on a number below 15. Some insist on a Cleansing number no higher than 12, and some insist on a Cleansing number somewhere between 0 and 12. I think a Cleansing number of 12 is satisfactory, but lower is in many ways better--if you can do this and still get the texture and other qualities you want. "Pushing the envelope" on your Cleansing number also risks formulating a soap with poor lather, but there are additives that will compensate for this problem, too. The easiest approach is to just add sugar to your recipe, up to a tablespoon per pound of oils. Adding milk, honey, beer, or any other liquid containing sugars will also work. Substituting apple cider vinegar for all water helps, especially if you also add sugar. Sodium lactate is said to improve lather. What does SoapCalc mean by "Condition"? Here is the page with their explanation of soap qualities: http://soapcalc.net/info/soapqualities.asp. What it says about their Condition number is this: "Condition - Conditioning refers to the soap’s emollient content. A soap’s emollients are left on the skin. They help the skin retain moisture. They sooth the skin and keep it soft. A range of 44 to 69 is satisfactory for this soap quality." Most soapmakers like their soap to have a Condition number at the high end of the recommended range. A high Condition number indicates a soap that is gentle to the skin. Most people (though not all) seem to prefer the feel of high-conditioning soaps, and many soapmakers were first drawn to making their own soap because of issues with dry, sensitive skin, or because they wanted to help the skin problems of their children, friends, or relatives. As with other soap qualities, you can only push the Condition number so high without compromising other desirable qualities--most often hardness and lather. When your recipe gets into the higher range on its Condition number, you are likely to need to add hardeners like salt or sodium lactate, as well as additives that boost lather, like sugar, honey, beer, or milks of some kind. These additives will only work up to a point, and how well they work can vary with each recipe, so the only way to learn how high you can push the Condition number without compromising other desirable qualities is through experimentation. Plus, of course, different people will have different preferences, and your preferences as a soapmaker will evolve. It is always a good idea to set aside a bar--or at least an end piece--of each batch of soap you make, to see how it performs over time. This is especially true whenever you venture outside SoapCalc's recommended ranges. You can watch for DOS and notice changes in appearance like cracks and discoloration. I think a Condition number of 58 is high enough--though I would like to push it to 60 or above where possible. 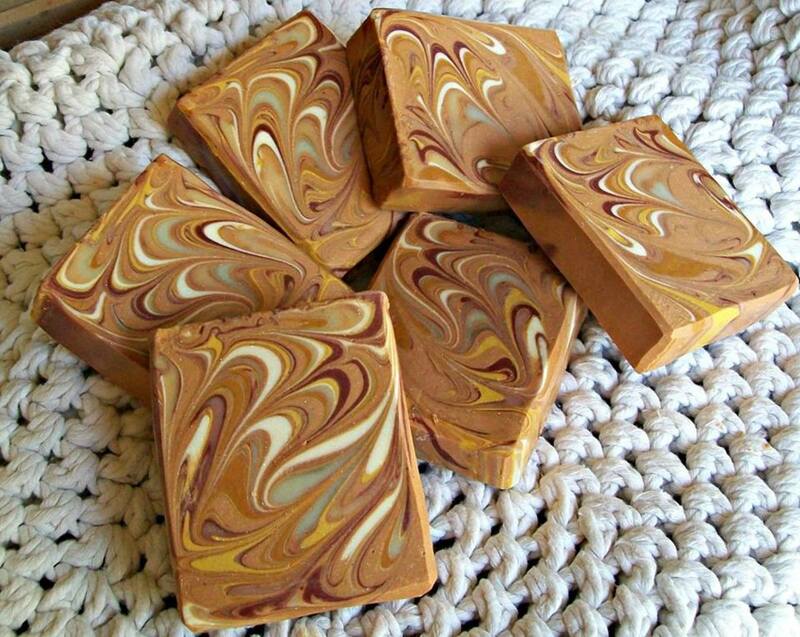 I have a few bars of a batch of soap that I made over a year ago, made with 50% sunflower oils and a Condition number of 72 . People who were gifted with bars liked it very much. I didn't care much for its appearance (it has an unappealing translucency), but I like its performance. It was also a little on the soft side, since I added no hardeners. Lather was good because of the addition of honey. Some bars got DOS after 6-9 months, and some bars still show no sign of DOS after more than a year. My final verdict on this soap: This may be a very promising recipe that could be developed into a truly great soap with a few tweaks. I guess the bottom line on the Condition number is that you must work out your preferences through experimentation. 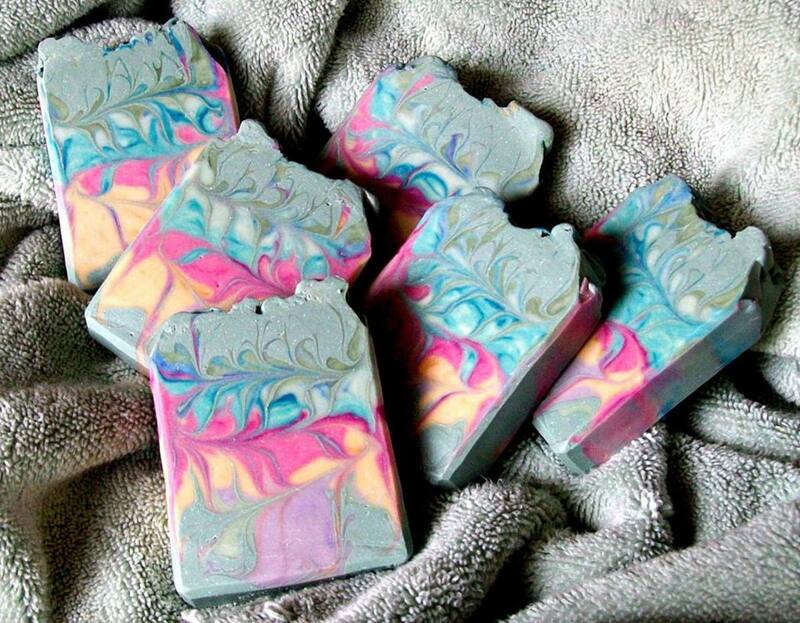 Good lather is a must in hand-crafted soaps, if you want people to like them. Most soapers rely primarily on coconut oil to provide bubbliness to lather, with the caveat that a soap with more than 20% coconut, unless with a very high superfat, will be too cleansing for most people's tastes, and can feel harsh. Palm and tallow provide creaminess. But again, if you load your soap up with oils that produce abundant lather, other soap qualities will likely suffer. I think the best approach to getting good lather is to make a high-conditioning, low-cleansing soap and don't fret too much if lather is at the low end of SoapCalc's recommended range on Bubbly/Creamy. Just add sugar, honey, beer, or milk for lather. These do a great job! Sugar is excellent for boosting lather, and if you have tried adding one talespoon of sugar per pound of oil to your recipe and you still think the lather is lackluster, you can always add more. Try adding 2 tablespoons per pound of oil. The lather of most soaps improves over time. My experimental soap with 50% sunflower oil and a Condition number of 72 has a Bubbly number of only 6, but the lather is, if not lush, pretty good, because of the addition of honey. Lather is another area where tastes and opinions vary. Some people will not be satisfied with lather until it explodes all over the tub. Others just want enough lather to feel assured the bar they are using is really soap. Some other things that help at least marginally with lather are subbing ACV for all water and adding sodium lactate. Salt added to soap for hardness will decrease lather. This is why salt soaps are made with a very high percentage of coconut oil--the only oil that will make a soap that lathers in the presence of high amounts of salt. Sodium lactate will harden soap without diminishing lather, and in fact is said to boost it. I am not even going to try to explain what these numbers really mean. Frankly, they remain largely a mystery to me. I have made lovely soaps that were seriously outside the recommended limits on both Iodine and INS. I have also made soaps outside these limits that were too soft. My general impression is that you can risk ignoring these numbers if your soap's Hardness number is high enough. Be aware that sometimes it works and sometimes it doesn't. Again, using my 50% sunflower oil soap with a Condition number of 72 as an example, Iodine is 98 and INS is 97--wildly outside recommended ranges. (It was an experiment, okay?) It is in many ways a pretty good soap. As with all else soapy, experience and experimentation is your friend. Many of these "not quite right" recipes can be the springboard to developing the Perfect Recipe. If you look further down the "Soap Qualities" column, you will see that SoapCalc also gives numbers for each of eight fatty acids. These numbers are the percentage of these fatty acids in single oils (in column one) and the combination of oils in your recipe (column two). These numbers are very meaningful in terms of the properties of your finished soap. If you are a beginning soap-maker, you will want to learn as much as you can about the properties of the various fatty acids. Here is one link that explains this, along with some of the special qualities of some of the fats, oils, waxes, and butters you might use for soap-making: http://summerbeemeadow.com/content/properties-soapmaking-oils. The more experienced you become in making soap, the more breathless your interest in the fatty acid profiles of different formulations of soap. One of the reasons that each soapmaker's Perfect Recipe is unique is because preferences as to fatty acid profiles of soap are variable. People with dry and sensitive skin can have a strong dislike for high percentages lauric and myrsitic acids in soap, and some don't care much for a high percentage of palmitic acid. Recipe nerds like myself have a keen interest in the fatty acid balance of a recipe and will tend to prefer soaps that are lower in lauric, myrsitic, and palmitic acids, and higher in oleic. They often like linoleic and linolenic acid percentages to be as high as possible without excessive risk of DOS (dreaded orange spots caused by the superfat oils in soaps becoming rancid). I don't have a clear opinion on the ideal percentage of stearic acid in soap, due to lack of experience and attention to this one, but I'm starting to notice that something like 10-12% is very nice. 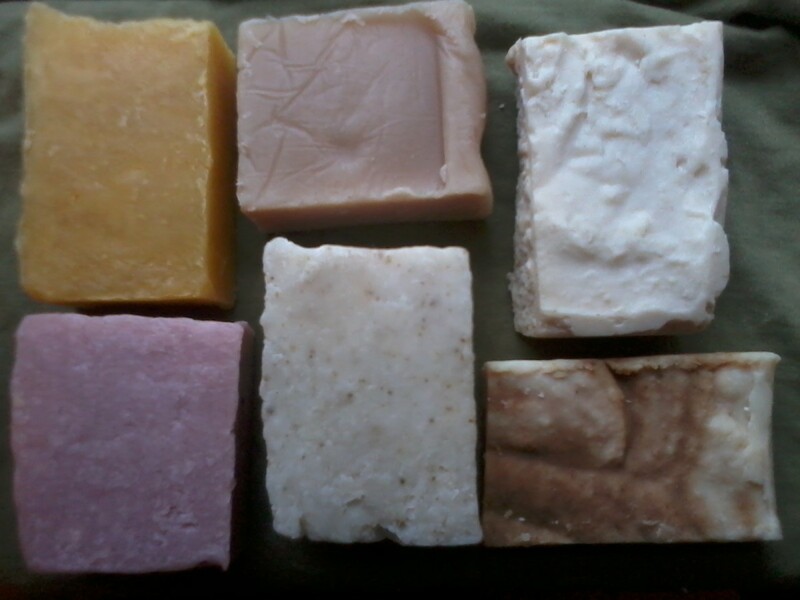 This link on The Most Popular Fatty Acid Profiles in Soapmaking may help provide some clarity: http://www.modernsoapmaking.com/the-most-popular-fatty-acid-profiles-in-soapmaking/. Superfat in soap is the percentage of unsaponified oils that are left in the soap after saponification is complete. Since soap is created through a chemical reaction between lye (a base) and fatty acids (weak acids in fats and oils), you may remember from Chemistry 101 that X amount of a base will only "use up" X amount of an acid. Because electrons. Once the lye in your recipe has reacted with the fatty acids in your recipe, it's just...gone. It's not there any more. Any oils that are still around after the lye is gone are called superfat. If you set your superfat to 0% in SoapCalc, it will give you a lye amount that (theoretically) will use up all the fatty acids in your recipe, so that there is are no oils still around after saponification is complete. This is not desirable. This is because the SAP values of oils used in lye calculators are averages. The real SAP values of the oils your are using are unknown. (Creepy, right?) These variations in SAP values are caused mainly by growing conditions of the animal or vegetable fats the oils come from. Maybe the real SAP values of your oils are higher, or maybe they are lower than the averages used by lye calculators. If you happen to be using fats and oils that have a lower SAP value than the number used by your lye calculator, there will be leftover lye in your soap. This is not good. A lye-heavy soap will be harsh and can irritate or even burn skin. This is why lye calculators have a default superfat setting of 5%--meaning the lye calculator will give you a lye amount for your recipe that will (theoretically) leave 5% of the fatty acids in your soap unsaponified. On the other hand, if the SAP values in your fats/oils chances to be on the low side, a 5% superfat ensures that all the lye in the recipe will be used up, by throwing in a little extra fat just in case. Okay, so what's NORMAL in the way of superfat? Again, conjuring the spirits of "experienced soapmakers," the preference seems to be for 7%-8% superfat. I use 8%. Some people in the soapmakers' groups on Facebook speak of using 10% superfat in their body soaps. I have never tried going up to 10% superfat, so I can't comment on this. Once again, experimentation is your friend. Much depends on personal preference and probably also on the way The Recipe is formulated. Much also depends on whether you have hard or soft water. You will see the Sat : Unsat Ratio near the bottom of the SoapCalc's lye calculator page, right under the fatty acids column. On the View/Print Recipe page, it is shown at the very top right of the page. This is the ratio of saturated fats to unsaturated fats in the recipe. Looking at it another way, it is the ratio of hard oils to soft oils. The most commonly recommended Sat : Unsat ratio is 60:40--that is, 60% hard oils to 40% soft oils. Many soapers prefer a 40:60 Sat : Unsat ratio. This is because the soft oils are the more conditioning oils, richer in what I would call the "nutrient" oils: oleic, ricinoleic, linoleic, and linolenic. In my view, anything in between the 40:60 and 60:40 is good, but if you want a soap with a high Condition number, you will almost certainly wind up with something more like a 40:60 ratio. The lower the percentage of saturated fats, the more likely you will need to add sodium lactate to your recipe for hardness. Soap #1 has a 36:64 ratio, which made its hardness marginal. Soap #2 has a 38:62 ratio. It is, in my opinion, a fine recipe with the addition of sodium lactate for hardness. Soap #3 is right at 40:60 (though this is cut off in the screenshot). With the addition of sodium lactate, it is darned near perfect. Soap #4 is also right at 40:60 and, in my opinion--with the addition of sodium lactate--is the best of all. Here again, no one can tell you what to do on this ratio, as it will depend on personal preferences. You may notice that health-food-store "real" soaps are quite hard. My impression is that soapmakers who sell a large volume of soaps wholesale feel the need to produce a very hard soap--probably harder than 60:40--because their soaps will need to stand up to shipment and handling, including some customer abuse at the retail store. Soaps for mass marketing will not sell well if they quickly start to look shopworn from handling. Protective packaging could help, but that increases overhead costs. On the other hand, if you are not mass marketing and sell mainly online or at craft fairs and farmers markets, or mainly make soaps for gifts, friends and family, and personal use, you are in a position to focus entirely on your personal ideas of a quality soap. Even if some of your bars get a little roughed up at the craft fair, you can tidy them up again. You don't have to compromise any soap quality at all because of the concern that your product will get banged up from careless handling. Now, in case you are interested, I will show you how my personal Perfect Recipe evolved. At the end of this journey, I will even reveal The Recipe! I am a crazy old woman with no expectation of ever having a real income from soapmaking. I sell enough to support my addiction, and maybe a tiny bit more, and I am content with that. None of my daughters are clamoring to take over the family business (since it..DUH...doesn't make any money), and I have no expectation of getting the Madame Curie award for my contribution to the science/art of soapmaking. So I see no reason not to share, and if you would like to use my recipes to build a soaping empire, you may feel free to do so. More likely, though, you may be able to use this illustration of the soapmaking evolutionary process to understand where you want to go with your own recipes and get some ideas about how to get there. All the soap recipes shown here are good recipes--except the first one. The first one is pretty marginal, but it was the basis for all the subsequent really good soaps. Each variation on the orginal not-so-good recipe produced (in my opinion) a better soap. You actually might not agree, assuming you wanted to test each one. You might prefer Soap #2 or Soap #3. The differences are not huge. While I have never known anyone to actually make any recipe I have offered them, in case you are interested in making Soaps #2-#4, these fit well in Brambleberry's 10" silicone mold, which you can see here: http://www.brambleberry.com/10-Silicone-Loaf-Mold--P5199.aspx. Here is the marginal recipe that was the springboard that led to all the others. NOTES: One ounce of sodium lactate was added to this recipe. I add sodium lactate to the slightly cooled lye water. If you look at the Iodine and INS numbers for this recipe, you will see that without sodium lactate this soap would be too soft. INS is too low and Iodine is too high. With the addition of sodium lactate, though, it works and is hard enough. One problem I encountered is that it would crumble when cut, or sometimes crack after cutting, unless cut with a fishing line. (Sodium lactate can cause this.) Superfat is 8%. I also subbed ACV (apple cider vinegar) for all water in this, and all subsequent recipes. ACV is beneficial for skin. It makes a nice mild bar, does not discolor at all, and is said to help lather. So you may wonder why I formulated this clearly marginal soap. I was shooting for a high Condition number, because I was on a quest for a high-conditioning soap for my delicate-skinned young-uns. Now, for your Cleansing number, SoapCalc gives 12 as the very lowest acceptable number for this. The truth is, almost all soapers seem to prefer a cleansing number that is 12 or lower. Notice that Cleansing in this recipe is 14--in my opinion, too high. EVALUATION: This bar was okay on hardness and had a nice moisturizing feel. Lather was adequate, due to the added sugar and ACV. In terms of appearance, it had a translucency that was unattractive--a bit of a "glassy" look. Don't get me wrong. It's not a bad soap. It just isn't all that good compared to the ones that follow. NOTES: Again, one ounce of sodium lactate was added to this recipe, ACV was subbed for all water, and 1 tablespoon of sugar was added for lather. Superfat is 8%. Notice that the only difference between this recipe and the previous one (except that I absent-mindedly dropped water from 38% to 33%--for no reason whatsoever) is that cocoa butter was added. When I experienced the sheer creaminess of the raw soap, I knew I was onto something. 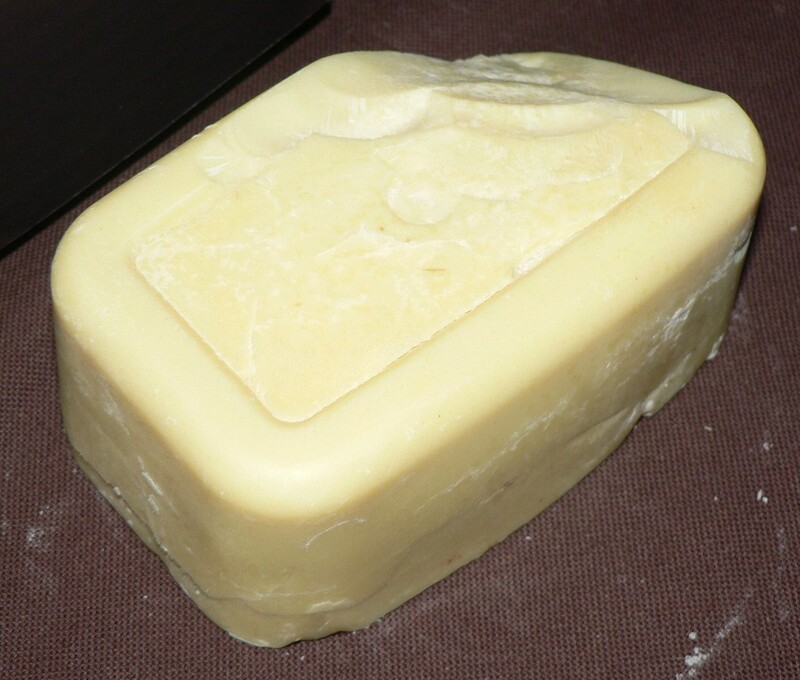 The addition of cocoa butter changed the whole character of both the raw soap and the finished soap. EVALUATION: This recipe is wonderful--well worth making. Texture, feel, and conditioning were lovely. The ugly translucency was replaced with a creamy look and a softer and smoother feel. I was still cutting with fishing line, because it works better and I was afraid not to when using sodium lactate, by this time. I made this recipe several times and was blown away each time. Unfortunately, the pictures I took of these batches have been lost. If I still had them, you'd see what I mean. This soap looks like Soap #3, though. You might even like this recipe better than subsequent variations. Notice that Cleansing has dropped from 14 to 13, and Condition has dropped from 61 to 60. This slight drop in the Condition number was well worth it. NOTES: Again, one ounce of sodium lactate was added to this recipe, ACV was subbed for all water, and 2 tablespoons of sugar was added for lather. Superfat is 8%. There are several changes. The reason for two of them is that I ran out of RBO (rice bran oil) and decided to try substituting lard. With the substitution of lard, I did not like some of the numbers, so I added sunflower oil. Specifically, I did not like the linoleic/linolenic numbers and the Condition number. Adding Sunflower oil helped, but not enough, so I decided to add a small amount of flaxseed oil. Also, this was partly because I had a great interest in trying flaxseed oil in soap, because it is so beneficial to skin. I have it on good authority that flaxseed oil should not be added to soap in an amount greater than 2%, or you'll have DOS problems. For this recipe, Cleansing has dropped to 12, while Condition has dropped to 58. But in my opinion Soap #3 is better than Soap #2. I think the lard gave it a better feel and the flaxseed oil compensated for the small loss in conditioning. Plus conditioning is still high. Note: Linoleic and linolenic acids saponify more slowly than other fatty acids, so in all likelihood the final superfat in this soap is largely linoleic and linolenic acids. These are the most skin-friendly of the fatty acids, so this is good. I used this recipe for about a year and was very happy with it. You will be too, but I would suggest increasing the sugar from 2 tablespoons to 3-4 tablespoons. NOTES: This time, 1.1 ounces of sodium lactate was added to this recipe (to compensate for the slight increase in the size of the recipe), ACV was subbed for all water, and 3-4 tablespoons of sugar were added for lather. (The actual amount of sugar was two Chinese soup spoons.) Superfat is 8%. 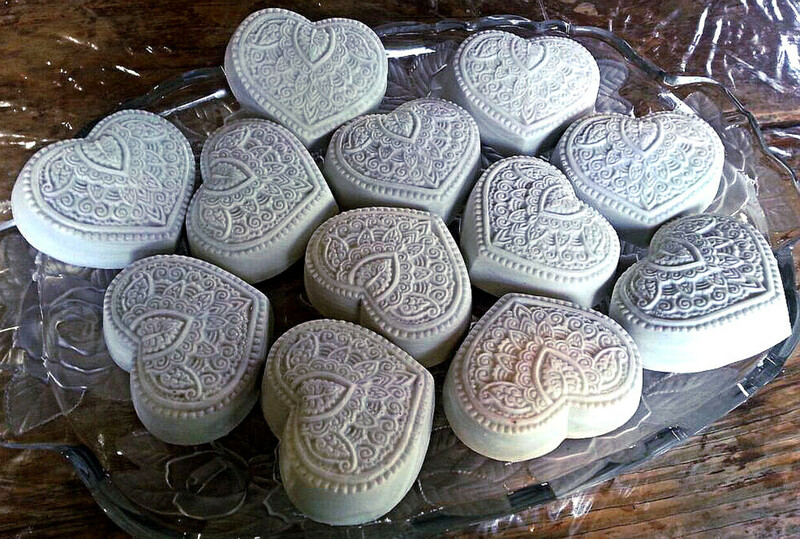 Ylang-Ylang Soap, Made with Recipe #4. In this variation, the main difference between Soap #3 and Soap #4 is that beef tallow was substituted for palm oil. Sunflower oil was increased from 3 ounces to 4 ounces to compensate for lower conditioning caused by this substitution. Condition, as in Soap #3 is still 58 and Cleansing 12. Meanwhile, I had accidentally discovered that more sugar would greatly improve lather, so the sugar amount was increased to 3 or 4 tablespoons. Also, I finally got it together and changed the water amount in the recipe to 38%. 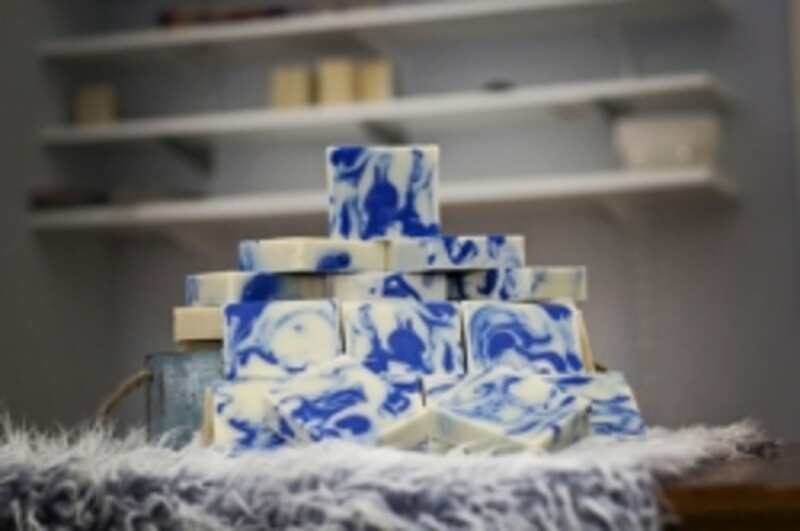 A higher water amount is helpful if you would like to do beautiful swirls in your soap, and to help counteract the effect of a fragrance that accelerates. As you can see from the photo, sometimes this is not enough. 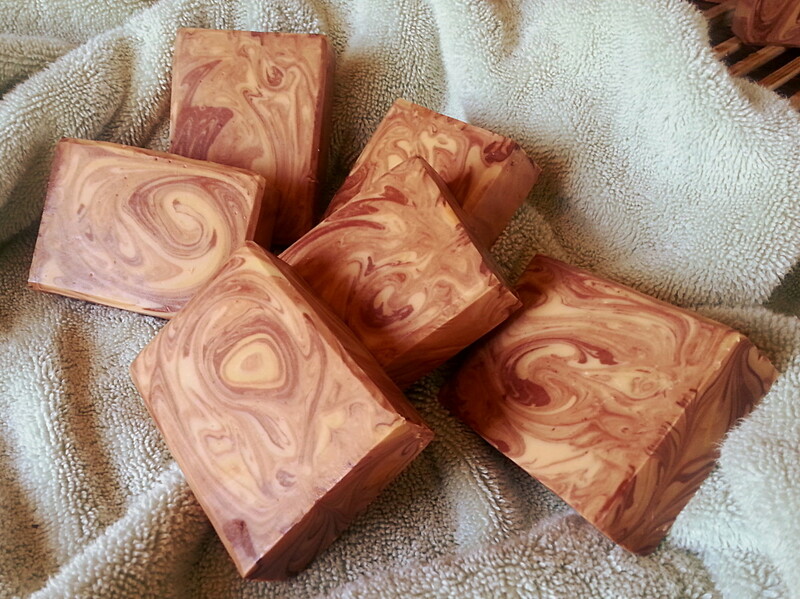 This soap was scented with Ylang-Ylang, and it accelerated on me, so the swirls lack finesse. The substitution of beef tallow for palm oil gave this bar "heft" and substantiality. In my opinion (which may not necessarily be yours), this last recipe is the best. Some experienced soapers may want to quibble about these recipes. Iodine is okay, after that first one, but INS remains low. The way I feel is, that's what the sodium lactate is for. Results are excellent anyway. One good point is that the cocoa butter content in these recipes helps to discourage DOS. Another suspected cause of DOS is the overheating of oils, or allowing them to heat too long. Heating unsaturated oils hastens their breakdown into rancidity. When you are working with a recipe that has a high amount of unsaturated oils and/or a high linoleic/linolenic percentage, there are some precautions you can take. When you weigh out your oils, weigh out the hard oils first and put them in the pot to melt. Then weigh out your soft oils and set them aside in a separate container and do not heat them. In these recipes, you would weigh out the canola, sunflower, and flaxseed oil and set them aside while the other oils are melting. After the hard oils have melted and cooled a bit, mix in the soft oils. That way you will not expose the more delicate oils to heat. Also, review other likely causes of DOS and be sure to avoid them. Here is a good discussion of DOS and what causes it: http://www.soapqueen.com/bath-and-body-tutorials/tips-and-tricks/dreaded-orange-spots/. Both the canola and sunflower oil used in these recipes are from Wal-Mart. I do not use high-oleic canola or sunflower. Some would recommended switching to these, and I wouldn't blame you if you were uneasy with Wal-Mart's offerings of these problematic oils. You can buy high-oleic oils at most health-food stores. With all oils that you purchase, look at the expiration dates. On Wal-Mart's canola and sunflower oils, the expiration date is printed directly onto the plastic in teeny-tiny letters in the general area of the shoulder of the bottle. In my part of the country, these expiration dates are always more than a year out--perhaps explaining why I have little trouble with DOS. I also keep canola, sunflower, and flaxseed oil--and any other highly unsaturated oils I may be using--refrigerated after opening. It would also be best to plan on using up these oils long before their expiration dates. If you live in an unusually hot, humid climate, you may want to go the high-oleic route with these recipes to avoid a disappointing surprise. If you substitute high-oleic oils, be sure to run the whole recipe through SoapCalc, since the change in the fatty acid profile will likely mean a change in the lye amount. Regarding subbing ACV for all water, this is just an idiosyncrasy of mine. You may want to use water instead. If so, it might be a good idea to use distilled water, since minerals in tap water can cause DOS. Finally, many soapers would not want to screw around with this many ingredients. And of course I am not saying anyone should run out and buy ten oils and butters. Many people are more strongly focused on other aspects of soapmaking--and there are many other aspects of soapmaking to focus on. There are artistic soapmakers, natural-ingredients soapmakers, goat-milk soapmakers, soapmakers who need a good hard recipe that will release from an intricate mold, and soapmakers who would prefer a more time-efficient formula that will allow soap sales to give them a reasonable return for their labor. I myself am a recipe nerd. But even if you are not a recipe nerd, I would like to think that some beginning soapmakers might enjoy--and profit from--this illustration of the process of formulating that Perfect Recipe. "The Recipe" is a Thing that is continually evolving, often by accident. Since I initially wrote this article, I've tried two variations of the final final final outcome, and I like both of them very much. The first variation came about when I got the Sunflower Oil bottle mixed up with the Canola Oil bottle and used 9 ounce of Sunflower and 4 ounce of Canola, instead of vice-versa. Lo and behold, this soap had not only a more luscious "feel" to it, but a somewhat better lather. I call this the "Sun-Can Swap Recipe," which is shown below. You can see that nothing else has changed in this recipe from the immediately previous one. One effect of swapping these two oils is that the combined linloleic/linolenic percentage is even higher than before, but with the precautions I've already described, DOS should not present a problem. As with previous recipes, ACV is subbed for all water and about four tablespoons of sugar is dissolved in the ACV before the lye is added to it, and then one ounce of sodium lactate is dissolved in the lye water. The "Sun-Can Swap Recipe"--the result of accidentally getting the bottles of oil mixed up. The next (and final, to date) tweak to this recipe was to substitute Avocado Oil for the Lard. The reason I decided to do this was because I had a large bottle of Avocado Oil I needed to use before its expiration date. I was even more pleased with this recipe than any of the previous ones--mainly because of the improvement in lather, which was probably because of a higher percentage of Stearic Acid provided by the Beef Tallow, and possibly also from the small increase in the Castor Oil. The linoleic/linolenic percentage is a bit lower, but still very high. This new recipe is shown below. I think it's the final winner! The total amount of sugar for the #4 recipe is 4 tablespoon or 4 tablespoons per pound of oils used? The amount of sugar suggested is for the total recipe. Four tablespoons is actually probably a little heavy on the sugar. I have since cut the sugar amount I use for this recipe to one ounce, which seems to be plenty. 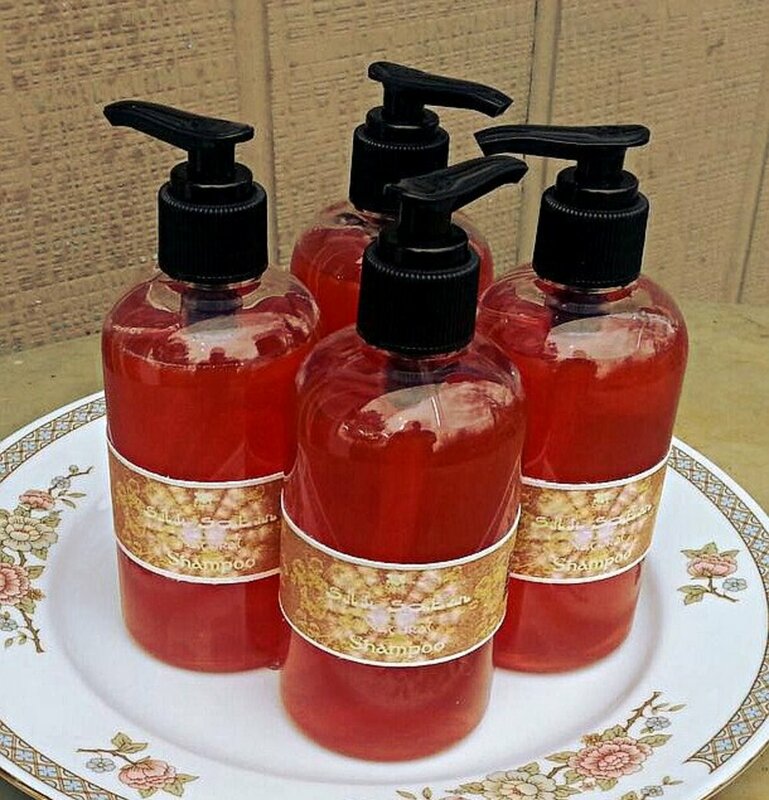 What made you decide to use apple cider vinegar in your soap recipe? I got the idea because that is the way Liz Ardlady's shampoo bar recipe is made--or one of her recipes. It supposedly makes a milder more gentle bar and helps lather somewhat. For how long do you cure your soaps? This recipe seems to need a six-week cure. I think this is mainly because of the fairly high water content, which is needed for nice swirls. I'm making hand milked, farm fresh, goat milk soap! Is it ok to use your sun-can recipe, substituting the apple cider vinegar and sugar for goat milk since the milk already has the sugar content? Or would I still need to add sugar? I don't think I quite understand your question. I think what you mean is, can you substitute goat milk for ACV and sugar. Yes, you can sub goat milk for all the liquid. You probably would not need to add sugar, but you could if you wanted to. I add agave nectar to my GM soaps. I add it to the oils before adding the goat milk/lye mixture. Adding agave to lye water causes a mini volcano. It kind of explodes. For GM soaps, always freeze the goat milk and add the lye to the frozen milk a little at a time, stirring constantly till the milk has melted. Do you think the addition of sugar is necessary if I am using goat's milk instead of ACV to create soap? I think there is probably enough sugar in goat milk that you wouldn't need any extra sugar. This recipe lathers reasonably well with no sugar at all, but I like lots of lather. I use sugar in my homemade soap recipe but I wonder if it is the reason I get sticky soap that does not come out of the mold or doesn't cut well. It seems to take a while to actually harden. I only use bottled water, lard normally around 33-40, olive normally 33-40% and coconut oil normally 25-30% at 38% water and with 5% superfat. I added my sugar to the lye water solution too. I am planning to substitute the olive for sunflower, so will probably increase my lard percentage? I don't think sugar is the problem. I think it is probably the fairly high amount of olive oil--which takes forever to harden. I personally don't usually like olive oil in soap--though many people do. Also, your percentage of coconut oil is higher than most people like. Coconut oil can be too harsh of a cleanser for a lot of people. I would say no more than 20% coconut oil, or less. I use 17% in my recipes. I would decrease the olive oil to about 25%--and if it was me I would choose a different liquid oil (or combination, such as sunflower, avocado, canola, hempseed, etc.). That looks like a good percentage for lard, but I'd also run the whole thing through soapcalc to check for soap qualities. Substituting beef tallow for most of the lard will make a harder soap. What would be a good substitute for beef tallow in soap? Substitutions should be run through SoapCalc, which will tell you how the substitution effects soap qualities such as hardness, lather, and conditioning. Lard or palm oil (or other hard oils) should be a good substitutes, but the whole recipe should still be run through Soapcalc to make sure no important qualities are compromised and to check the amount of lye needed. I noticed you said to dissolve the sodium lactate in the lye solution. Do you use sodium lactate powder? I use liquid 60% sodium lactate. If you use powder in this recipe, does that mean I should increase the amount by 40%? I use liquid sodium lactate (from Soaper's Choice). To be honest, I have never looked at the percentage, but I am guessing that the kind I use is 60%. Again, guessing, I would tend to assume that recommendations about the percentage of SL to use are based on using a 60% solution. E.g., the maximum SL percentage is 5% for cavity molds and 3% for loaf molds. These recommendations are probably based on liquid SL that is 60%. The reason I say this is that I have never seen SL powder for sale, and I suspect it is rarely used, at least not in soapmaking. I know lye and water can be mixed the day before when making soap. Can I mix the ACV & lye the day before? Did you soap at room temperature? I'm going to try out the final recipe tomorrow, subbing sunflower for the linseed, only because I don't have linseed and I don't want to wait. I'm also going to add a little ROE to hopefully help fight DOS, since I do live in a hot, humid climate. Yes, you can mix the lye and ACV the day before, or a few days before. I often measure out everything I need to make two batches of soap and set the containers aside until I have time to finish the process. I may make one batch the next day and the other batch several days later. You just need to be sure that the lye/ACV mixture is in a container with a secure, air-tight closure. I always soap at room temperature. Since I don't have central heat, room temperature is kind of variable at my house, though. The ROE is probably a good idea, though I have never used it. What is the recipe for the #4 soap? How do I make the basic soap for that? If heating soft oils contributes to DOS, do you think making a soap recipe by a hot process will make the soap more likely to develop DOS? I don't know for sure, but I would guess that HP soaps would be more likely to develop DOS sooner than CP soaps for that reason. How do you use ACV in a soap recipe? Do you freeze it before adding the lye? No need to freeze the ACV. Just use it at room temperature, right out of the bottle. Yes. Honey works fine. I would be a little cautious about mixing honey with the lye water, however. You might want to add it to the soap after you have mixed in the lye water. I have used agave nectar instead of sugar, but the first time I tried it, I added it to the lye water. This caused the lye water to shoot out of the container like a geyser. So I add agave nectar to the soap now. Honey may act the same way. This is without a doubt the best article I have read on soap making. A goldmine of information! I especially appreciate the tips on dos and info about saponification of linoleic & linolenic acids. Thanks so much for sharing the recipes. This is such a mine of knowledge. I am so glad i landed here. Also your soaps are absolutely gorgeous. There aren't too many other oils that will provide high amounts of linolenic: Sacha Inchi (48%) would be good. Sea buckthorn seed oil is 38% linolenic. Pomegranate seed oil is a whopping 78% linolenic. Perilla seed oil is 56%. Some others are also reasonably high in linolenic. Black currant seed oil might be nice, as it is 29% linolenic and also contains gamma-linolenic acid (GLA), which is very good stuff! Borage oil is not especially high in linolenic, but is very high in GLA. If you aren't concerned about the linolenic, you could substitute for the flaxseed oil by adding a little extra sunflower oil--though you should run any substitutions through soapcalc. The flaxseed oil is also for a little extra skin-loving touch. You could add a small amount of many other somewhat fancy oils for this purpose--whatever you like. Linolenic acid is used to heal, hydrate, and plump skin. (I don't know about the "hydrate" part.) Flaxseed oil was long used to treat burns. I don't know if it still is. I am glad you asked this question, as I had never really looked at which other oils might provide lots of linolenic. Makes me want to try subbing sacha inchi, pomegrante, or perilla in this recipe, myself! Cost is of course an issue for many of these, so I'd also have to look at that. This is one of the most detailed articles I have ever read. You put a lot of time into this and it’s appreciated. If you had to substitute flaxseed, what would you try/suggest? The four tablespoons I suggested is for the whole recipe. I've since decided that you don't really need that much and I now use only one ounce. The 4 tablespoons of sugar used in your #4 soap recipe is that the total amount of sugar used for the whole recipe or 4 tablespoons per pound of oils used? Thanks for sharing your recipes. Honey can be a nice addition to soap as, like other sugars, it helps lather. Beeswax in sometimes used in very small amounts to harden some soaps. I'm not much in favor of adding beeswax to soaps. However, there are many, many other uses for beeswax and other bee products like propolis. These are great in salves, lotions, balms, lip gloss, and lotion bars. People who use herbs or flowers like calendula usually infuse the herbs in the oils they use for soapmaking. Plus calendula and other herbs are commonly used in lotions and healing balms. 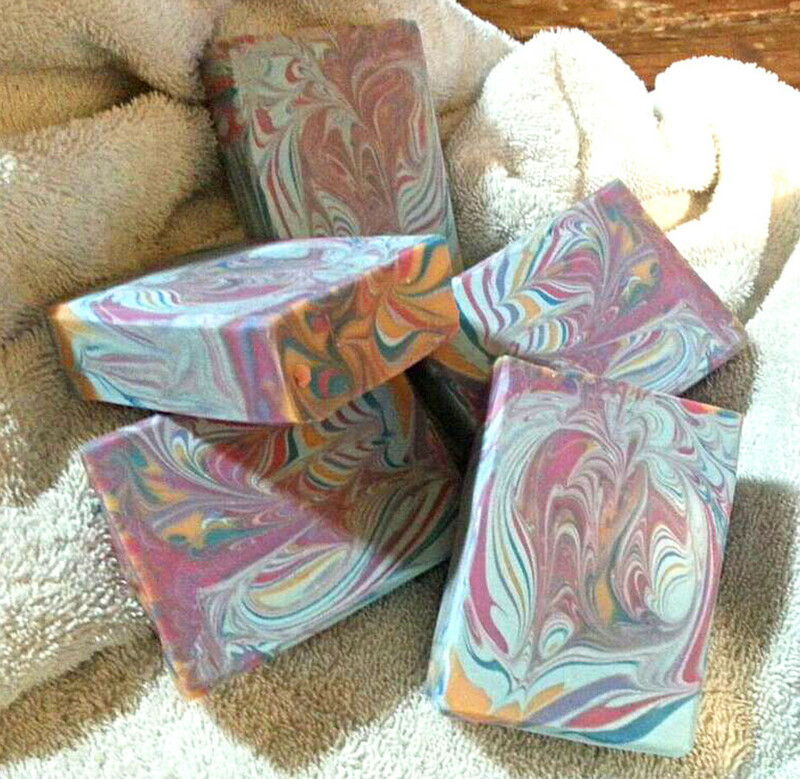 There are many techniques for creating swirls in soaps. 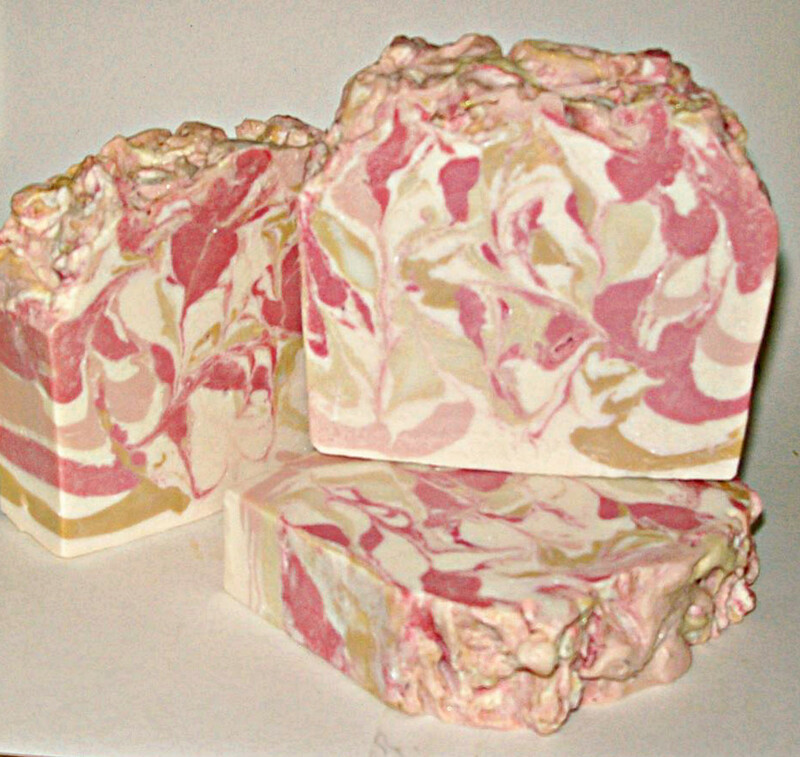 Soap Queen is a good resource, plus there are many online videos showing how to create swirls. I would suggest that you join about a dozen Facebook soapmaking groups. These groups share a huge amount of information about all the things you are interested in--plus a lot more. But there are many more groups. Just do a search for soapmaking groups on Facebook. I am so grateful for the information in your article. It is so comprehensive and gives me confidence to try making soap myself. I have an olive farm in Portugal and would love to use my own olive oil and bees wax and honey. I also love gardening and am growing flowers for natural colouring such as calendula. Does anyone have a reliable recipe including these ingredients? Also how do you get the swirls in soap? Mix the sugar with the ACV (or water) before adding the lye. Add sodium lactate after adding the lye. If you add sugar after adding the lye, the sugar won't dissolves, but works just fine if you add it first. Thank you for the great article. I am a beginner and have not used sodium lactate or sugar before. I want to try your recipe #3 and am wondering when do I add the sodium lactate and sugar? Wonderful article with so much helpful information. This recipe needs a six-week cure. If you want to get nice swirls, you pretty much have to use 38% water. With 32% water you could probably get by with four weeks. Thank you for the excellent information. How long do you allow your soaps to cure? Yes. ACV is no problem at all in hot process soap. I've made Liz Ardlady's hot process shampoo bars (made with ACV), and it works fine--with no vinegar odor. I also made liquid shampoo using vinegar instead of water for the lye water, with no problems. Can this be done Hot Process using that much ACV? PAT-CH-EM, lard and tallow each bring distinct qualities to soap. Lard brings a rich, emollient quality and tallow brings hardness and "heft." If you look at each of them in SoapCalc, you can see that they are both high in Conditioning and low in Cleansing--perfect for people with dry and/or sensitive skin. Both make long-lasting bars, as well, due to being low in lauric acid. There aren't any real rules about the fats and oils that can be combined in soap. Ultimately, you are looking at how your overall combination of fats, oils, and butters stacks up, in terms of providing the qualities YOU are looking for. I have definite ideas about what I'm looking for--and other people have somewhat different ideas. I create recipes by plugging them into SoapCalc and trying different additions and substitutions until I hit the "numbers" I am looking for. If lard or tallow--or both--help the recipe get the Hardness and Conditioning numbers I want, I use either or both until the numbers come right. Hello Sharon, I use equal amounts of lard and tallow in my recipes. I just surfed the web for 2 hours looking for information about using both in a recipe . I could not find anything. Everyone uses either tallow only or lard only, not both. It had me wondering if my soap would be better with just one. I then found your #4 and #5 recipe's have both and look similar to mine. Do you think that using both can offset their purpose? Soapcalc refers to flaxseed oils as "Flax oil/linseed." My understanding is that, technically, there is a difference, in that linseed oil usually refers to the oil used in oil painting, or to the "boiled linseed oil" used in wood finishing, which should not be used in soap. So you want to use flaxseed oil purchased from a soap supply company, or flaxseed oil from the health food store. In other words, don't buy linseed oil from the hardware store! This is an excellent and comprehensive article. As a newbie I was thrilled to find I'm somewhat on the right track. I've read about using Tallow but have been hesitant, now you've convinced me. I'm going to try your "Sun-Can Swap Recipe". Is Linseed Oil the same as Flaxseed Oil? My guess is that your volcano was caused by either the ACV temperature being a bit too high, or because your container was too small. I have sometimes noticed my ACV/lye mixture getting a bit out of hand during very hot summer days when the ACV was unusually warm. Choose a container for the lye water that allows plenty of room for the mixture to bubble up. Some people like to mix the lye water in the sink. It also helps to add the lye to the ACV slowly, while stirring. I don't think using ACV lowers the pH of the finished soap by much. To the extent that the ACV consumes a portion of the lye, it will increase the superfat percentage of the finished soap somewhat. If you assume that the superfat is increased by the weight of the acetic acid portion of the AVC (which is normally about 5%), using ACV would increase the superfat quite a lot. But I have been told that this is not the correct way to calculate this and that calculating the increased superfat percentage requires using molecular weights, and that the correct manner calculating indicates very little increase in the superfat percentage. Calculations involving molecular weights are a bit over my head, so I can't verify which calculation is correct. However--even if this recipe does give a soap with an insanely high superfat (which it probably doesn't), it's an incredibly good bar that feels great, and gives excellent cleansing and lather. Hi, I was wondering what I did wrong. I added the lye to my ACV and it volcanos. What a mess it was. Can you give me any suggestions, also I understand that ACV also lowers the PH of the soap. I want to use Sunflower Oil, has anyone ever worked with it? I use a digital scale from Wal-Mart. I think it is their cheapest. It will weigh in both ounces and grams. The main defect to this scale is that the battery is held in the battery compartment by a flimsy piece of plastic. When the breaks, the battery is not well secured in the battery compartment, and there is a bad connection that causes the scale to "drift" or otherwise be inaccurate. It also doesn't want to register anything under 5 grams. It might be wise to choose a somewhat more expensive scale--though I can't guarantee that a more expensive one will not have defects. I love experimenting with soap! I am thankful for the online lye calculators such as SoapCalc. I once tried to do this calculation with a pencil and paper, and it was quite a chore! Lard is a wonder oil for soaping, or to include in a recipe. Nice on the skin. Adding coconut oil to a lard recipe will give more lather. I like flaxseed oil in soap, as its high linoleic/linolenic content is good for skin, but if you use more than 2% flaxseed oil, there is a risk that the soap won't keep very long and could develop DOS (dreaded orange spots), which indicate rancidity. But a soap made with lard, coconut, and flaxseed oil sound like it would feel WONDERFUL! Colorants that are not intended for soap (like red drink mix, or food coloring, or some natural colorants like herbs and spices) have a tendency to react with the lye in soap to produce unintended colors. The same thing is true of fragrances. It's hard to say whether the cherry scent will come through the soapmaking process. I don't know if you can use oil paint to color soap, since I don't know what is in oil paints. One of the colors used in oil paints is Titanium White--which I would guess is titanium dioxide emulsified in oil. Titanium dioxide is widely used to color soap, and it's inexpensive--much less expensive than a tube of white oil paint. My impression is that many of the colorants used in oil paints are the same ones used in soapmaking, such as the oxides and ultramarines, but these colorants too are quite inexpensive compared to the cost of oil paints. Red oxide, yellow oxide, ultramarine blue, and titanium dioxide are available from soapmaking suppliers. I don't know what oil is used to emulsify these colors in oil paints. It might be something you wouldn't want on your skin. Many soapmakers use kitchen herbs and spices, such as turmeric or paprika, to color soap. These natural colors are nontoxic and can turn out nice, but they fade over time, especially if exposed to sunlight. I once use pokeberry juice to color soap, expecting a purple color. I got a nice sage green. I'm told that yellow dock root--a common weed--gives a nice pink/red color. The colorant options are almost infinite. I prefer micas because they're easy to use and, from a reputable supplier, there will be no surprises. Essential oils and fragrance oils work best for scenting soap, but I understand it's possible to get a light fragrance by infusing herbs in your soapmaking oils. I don't know how well this works, but it would be an interesting experiment! Made my first batch 40 yrs ago when no calculator. First time to try diff ingredients. I make lye soap as my Mom taught me. Great to get my oil paint out of clothing. Keep a bar in my paint box to rub on immediately after paint gets on something. Then wet and put on more soap. I had some coconut oil and flax oil given to me. I used substituting 1/4 cup of each oil to equal my usual lard recipe. 1st using diff oil and scent. Trying a small batch with red drink mix dissolved in water. Can I use oil paint to color soap? If you reproduce an identical fatty acid profile to my recipe, you should get similar performance. I ran your recipe through SoapCalc. The only problem I see is that your INS at 127 is pretty low. In my recipe, it is 131, and that is below the recommended range. Your Sat/Unsat ratio is the same as in my recipe, as is your hardness. But your soap could come out too soft. You will definitely need sodium lactate, but realize that it can only do so much to harden soap. Sugar will be helpful for lather. 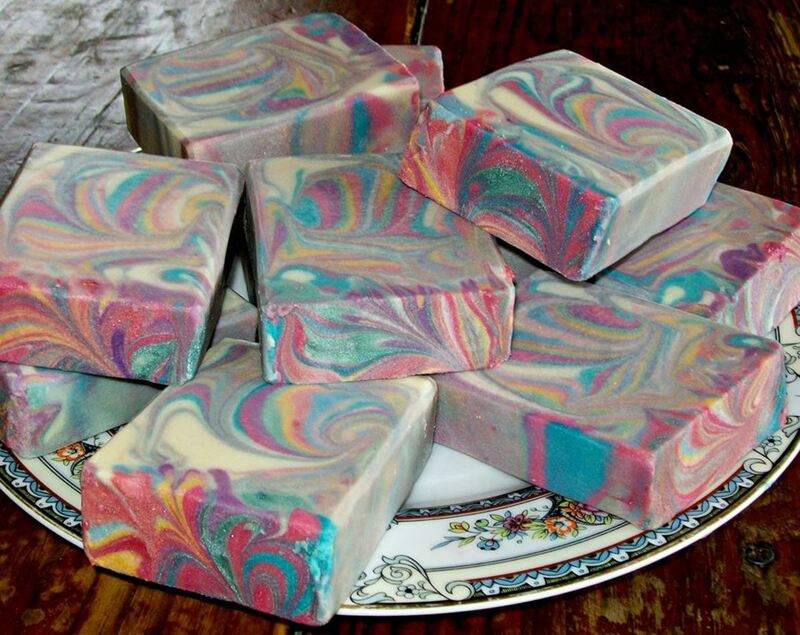 It's actually pretty hard to know how a soap will turn out until you make it. One reason may be because oils may contain fatty acids that are not included in soap calculators, and some oils are higher in "unsaponifiables" than others. So there are some unknowns involved in formulating a recipe. I tend to feel that butters improve soap a lot. This may be because they are high in "unsaponifiables"--components that don't turn into soap, and are thought to be beneficial to skin. Butters change the character of the raw soap--and the finished soap--in ways I think are good..
You should give your recipe a try and see what you think! The only way to arrive at a recipe you are happy with is to experiment. Thank you for this. It is an excellent article. 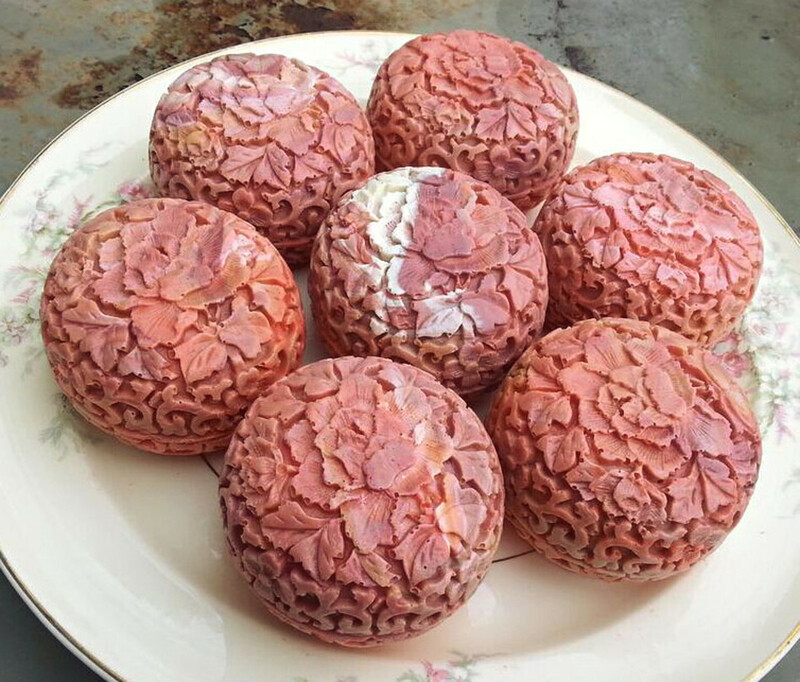 I also find the soap forums a bit frustrating with the unwillingness to share good recipes. If I reproduce the fatty acid profile of your soap, but with supermarket oils, will it have the same performance of your soap? Using a different percentage of canola, castor, coconut, sunflower, and tallow I could come within a point of every fatty acid, but the ingredient list is shorter, and there are no exotic butters. How do you think the following soap would perform? Thanks Kim! From the start, I was trying to develop a soap recipe for my daughters' dry and delicate skin. Soapmaking is so interesting because it's not just about making soap. It's about making an absolutely glorious soap that makes your skin sing! Hi Sharon, I have just read your article, it is so informative couldn't stop reading. I use soap calc all the time, I have found this to be the best for me but your explanation have let me understand it even further. I am going to try using probably # 4 but with water instead of acv. I am trying myself to get that perfect recipe. Your soap are absolutely beautiful. Thanks for all the info. Thank you, Peggy! You are making me blush! I am so impressed with this!! My soap is boring compared to your swirls! I'm excited for you to try the recipe (or recipes)! I hope you'll let us know the results. I think just about any butter would work fine--though be sure to put the resulting recipe through SoapCalc, in case there is a change in the amount of lye. I suspect that the important thing is that total butters be about 15%--though some people use a higher percentage of butters. I'm inclined to think that the only butter best not changed is the cocoa butter. You could try about 7.5% shea and about 7.5% cocoa butter. Wow what an informative post. I had to read it twice to let all that sink in as I was playing around with the soapcalc side by side. I cant wait to try our your recipe but do not have mango butter (or easy access to it) . Do you know what would be a good substitute - maybe shea or avocado butter that I do have around? Thanks a bunch! I don't know for sure. I haven't had a DOS problem--using the precautions in the article. (Not heating soft oils is, I think, the most critical thing.) I recently noticed that one bar that is about 5 months old got DOS, but it was kept in the bathroom, where there is constant high humidity. Soaps I keep in there are nearly always sweating. Under normal conditions I don't think I'd see DOS for a very long time. I'm thinking a year or more. 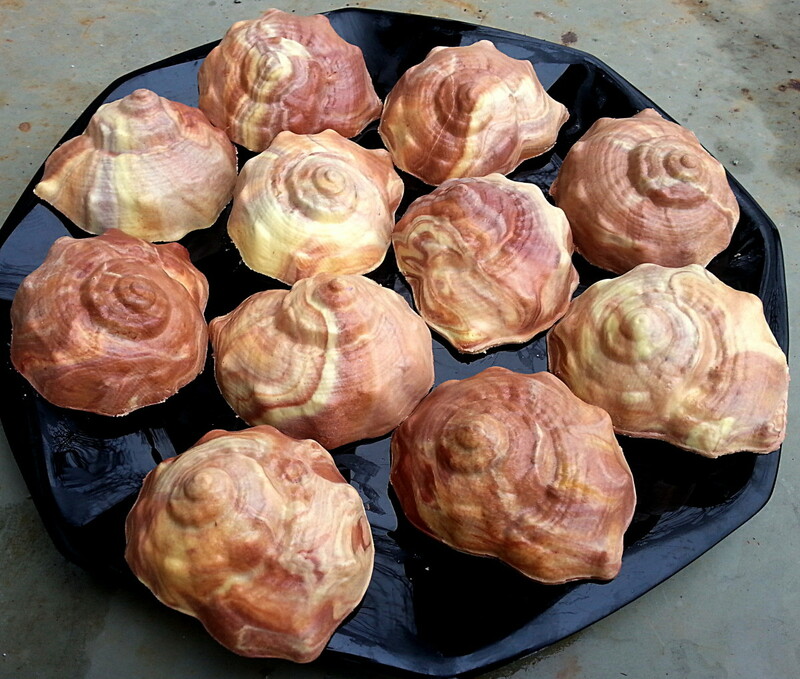 Hello Sharon, I have made 8 batches of soap using ACV since I have read of you doing so. The ingredients in the ACV that I have been using lists water, not distilled water. Will I have a greater chance of getting DOS down the road? PAT-CH-EM, thank you for your kind words about the swirls! Believe me, not every soap I make is a success along those lines. I am still learning and trying new things. The soap doesn't retain any ACV smell. Also, the ACV does not discolor soap at all. I think the acetic acid in the ACV reacts with lye to form sodium acetate. There are other organic materials in ACV, which probably all react with the lye as well. Subbing ACV for all water is probably not necessary. It's just become a habit with me. But I do think it's wise, if you use water instead, to use distilled water, especially in recipes with a high linoleic/linolenic percentage, since the minerals in water could cause DOS. Sharon , Does the scent of the ACV interfere with floral EO'S or FO'S ? Hello Sharon, Thanks for the information, I use beef tallow in all my recipe's. I will increase the percentage. I will try the ACV also. Here are some things that help boost lather: 1. Sugar, or anything with sugar in it, such as milk. 2. Sodium Lactate, which hardens soap and acts as a humenctant for skin, besides boosting lather. 3. Substituting apple cider vinegar for water in the lye solution is said to boost lather. Try including Beef Tallow in your recipe. In the most recent tweak to my recipe--the last recipe shown in this article--I increased the Beef Tallow to 22%. I formulated this recipe because I wanted to try substituting Avocado Oil for the Lard. 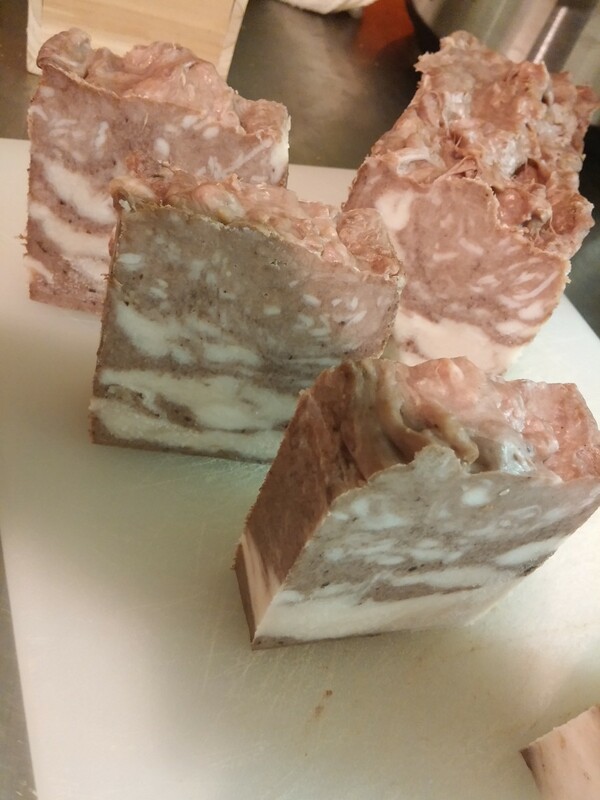 I increased the percentage of Beef Tallow so the soap would not be too soft. This change resulted in a great improvement in lather. I think the reason is because Beef Tallow has a very high "creamy" number (50), because it is high in stearic acid. Babasu has a high "bubbly" number, but a low "creamy" number. Hello, I have used over 200 different recipe's and am still not pleased. I also focus on the cleansing and conditioning numbers, I also want it to be thick and creamy.I have tried many different oils as you have. I now use only 5. I add tussah silk , sodium lactate , kaolin clay, vitamin E and colloidal oatmeal to each recipe. My recipes's are all 38 ounces of oil. Two years ago when I began , I thought that I had the perfect recipe because it was 60/40 hard to soft. I wasn't aware that the cleansing number was 29. The lather was incredible. People in my family said that it made their skin dry. I was using summerbeemeadow.com and they did not have the guidelines for cleansing , creamy etc. I use babassu instead of coconut. I thought that my additives would increase my lather. I just made 120 bars increasing my castor oil to 15% hoping that will do it. My cleansing is 15 and my conditioning is 59. everyone says that their skin feel great , I am not happy with the lather. I would appreciate any suggestions that you may have. Not a stupid question at all--as I found when your question caused me to try to figure out the answer! The percentage of acetic acid in ACV is only 5%-6%. So the amount of acid in 15.5 ounces of ACV IS .775 ounces. As best I understand the chemistry, which is CH3COOH + NaOH → CH3COONa + H2O, it looks to me like the chemical reaction would in fact "use up" .775 ounces of the lye. I'm not sure about this, because I think the molecular weights of the elements is involved in this, and I don't know how to calculate this. I guess I could look up the molecular weight of each element, but I fear I would be in over my head. In any case, if the weight of the ACV does in fact neutralize an equal weight of lye, the final soap recipe made with Avocado Oil (and probably the others as well), subbing ACV for all water should result in a 20% superfat. I never calculated out how much this increases the superfat before! Had I known, I would have been scared to go this high! But it does make a good soap. You might try the recipe both ways: with distilled water, and with ACV subbed for all water. See which you prefer. I should probably do this myself. I have an almost superstitious attachment to the idea of using ACV, but a 20% superfat WILL have an adverse effect on lather. (Though ACV itself boosts lather.) If I tried these recipes with distilled water, I might find that the lather was luxurious beyond all expectation! Thanks for bringing this up! I didn't realize how high I had gone with the superfat (though I, and everyone else loves it for the feel on the skin), and you gave me the incentive I needed to figure it out. not to be sounding too stupid here but wouldn't adding ACV to the sodium hydroxide cause it to become neutralised or partially neutralised, taking away from the amount there to saponify of the oils causing a greater superfat? Thank you so much! These are the things I learned over about three years of soapmaking, (I'm a relative noob, myself.) As you develop recipes and play with them, making substitutions--often because you ran out of an ingredient, and you really need to make soap--you discover how much difference relatively minor "tweaks" can make. When I tried the last recipe posted, I fell in love with the results of a higher content of beef tallow--which also does wonderful things for lather. Your article is so helpful to any "newbie" soapmaker! I have tried a few batches and wanted to go more moisturizing but was a little scared with hardness numbers of below 40. Your recipes with adding sodium lactate have now opened my mind to try more recipes for soaps great for winter dry skin use. Also, I never knew that just adding sugar, milk or honey could boost latger! Thank you so much! I did a test run on your lye/soap calculator, and I think many soapers would find it offers useful information that (as far as I know) isn't supplied by the other favorite lye calculators. I like that it gives percentages for caprylic and capric acids. I'll have to do a little research to find out the properties of these fatty acids, though from a little looking around, it appears they may fight yeast infections. I also think it's wonderful that you provide a figure on the amount of glycerin found in the finished soap. I wasn't able to input my recipes shown on this blog, because both mango butter and flaxseed oil seem to be absent from your oil selection. I hope you can include them at some future date! But I'd encourage soapers, especially advanced soapers, to have a look at your lye calculator! Regarding the Lye/Soap Calculator, we would like to invite you to try our Soap Calculator on our web-site. It is the 1° (and only) Soap Calculator able to calculate also the % of Glycerin inside your soap ! I hope you'll give either of these versions a try! Either way, it sounds very good to me. A couple of months ago, I accidentally swapped the Sunflower for the Canola in recipe #4. That is, I used 9 ounces of Sunflower and 4 ounces of Canola, instead of vice-versa. I like the feel of this recipe better--though it really pushes the envelope on linoleic/linolenic percentages. Thank you so much, Kristen! 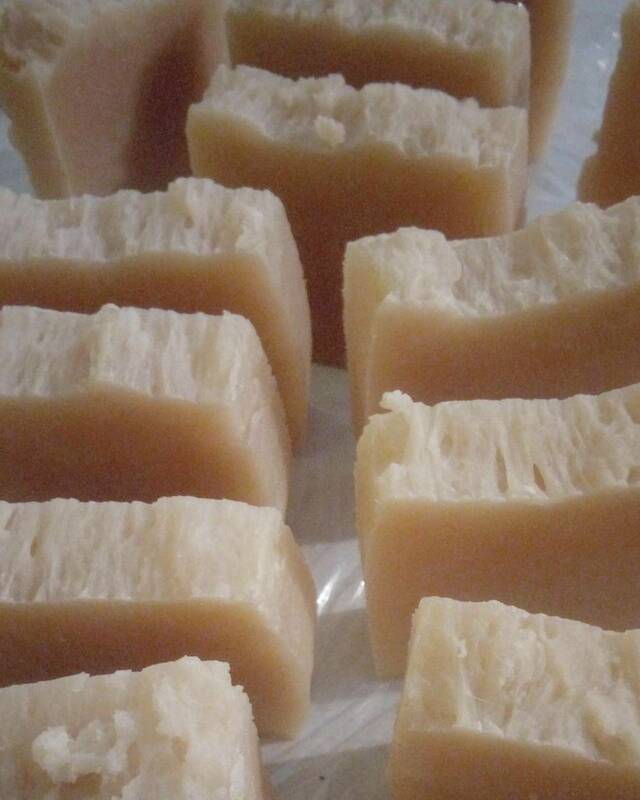 Homemade soap is much more gentle on your skin than most commercial soaps. But for many soap-makers it's also a creative outlet--a chance to play with colors and fragrances and designs. 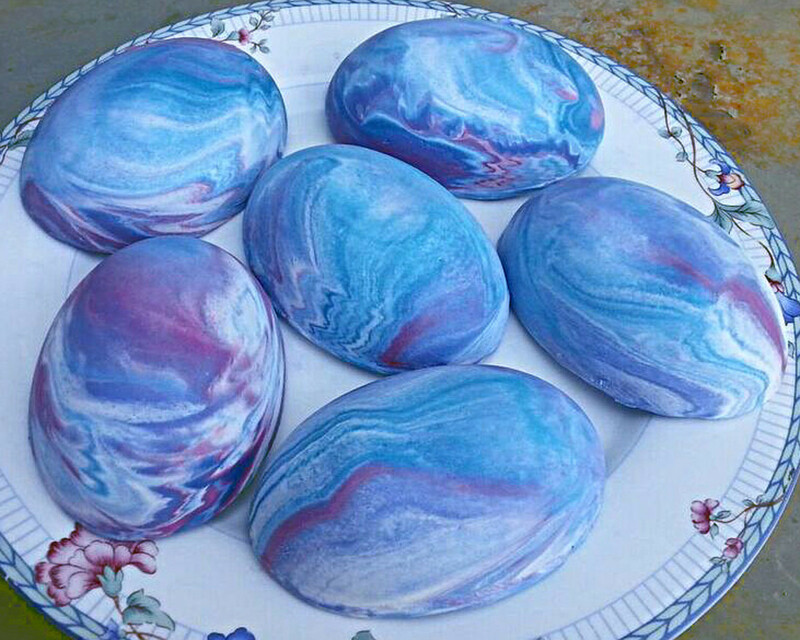 Sharon, those soaps you've made are super cool and colorful. What a great idea to make your own and save money would can buy at the store. 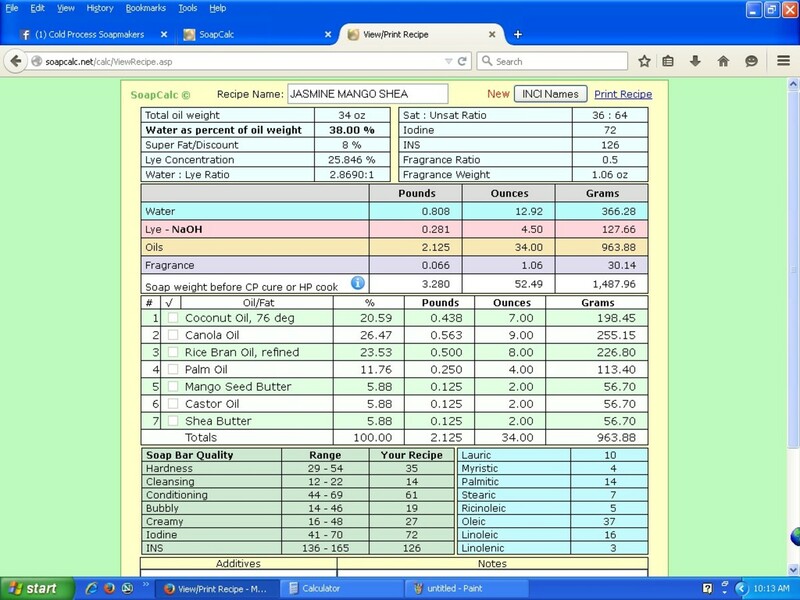 That spreadsheet is clever to keep track of your soap making efforts and calculations. Lovely pics! I love making soap! Soap-making is a crafter's dream come true, since you get to work with color, fragrance, and shape/texture, plus the product is even useful--which means you also work to optimize its usefulness. I suppose the reason so many people take up soap-making is that it appeals on so many levels. 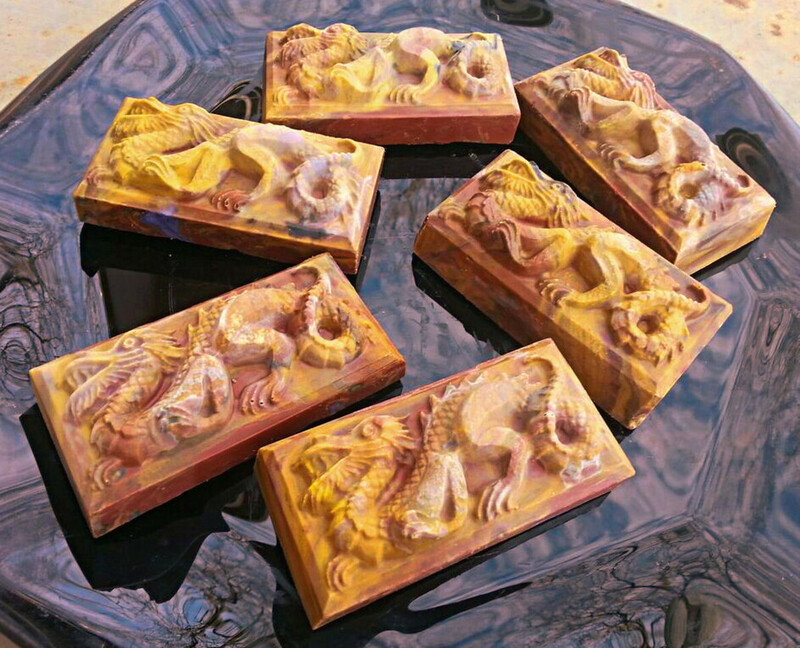 Lovely soaps, they have lots of eye appeal! I love the idea of unique soaps for personal use. Thanks you for such kind words. I think a good recipe often happens more by accident than anything else. I enlarged the Soap #4 screenshot, as maybe others are having trouble reading it. If you like, I'll enlarge Soaps #2 and #3. You can also enlarge these pictures by clicking on them. They can then be saved to your computer, where there is normally the capability to enlarge them when the file is opened. Can not see the soap calc recipe. Too small. Have you posted the recipe #4 elsewhere? I loved reading your article. These soaps are beautiful just to look at. Practical also. I think you are really on to something not only old school but an all around funtastic way to cheer up a bathroom. I am not sure about all of them. Probably most are a few days after cutting. Very informative! 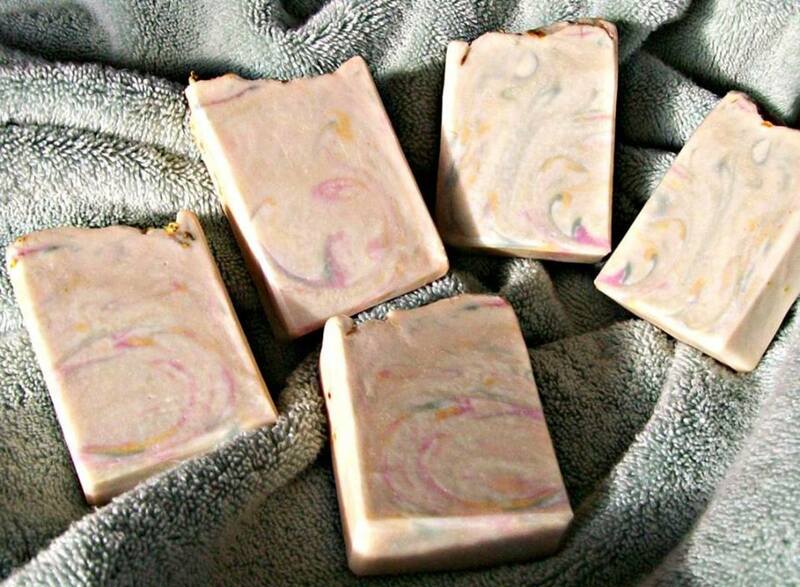 Do the photos depict your soaps after cure or a few days after cutting?